GolfBC Gift Cards - Buy golf gift cards online! From green fees to lessons to equipment purchases; even lunch and dinner, the GolfBC Gift Card gives you all the options. 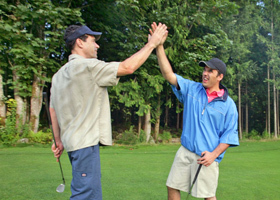 Redeemable like cash at GolfB's golf courses in British Columbia; it's the ideal gift for people who enjoy the game, just like you. Sending a gift card just got easier with virtual Gift Cards from GolfBC! Buy online and choose from 12+ templates, add custom message and send/redeem instantly via email at any GolfBC course in British Columbia. ***IMPORTANT: Please note, virtual gift card receipts or notification emails are not actual gift cards, and will not be accepted as payment. Click on "view gift card" in the gift card email to download the gift card with barcode: VIEW INSTRUCTIONS HERE. Simply present the card (or show on smart phone, if virtual card) for payment, and the value will be deducted from your credit account - balance will be shown on your receipt. Continue to use the card until the balance is depleted or re-load at any time online or in the Golf Shop. NOTE: Effective October 11, 2017 Gift Cards are not available for purchase or redemption at Furry Creek, due to change in ownership. Gift Cards are not available for purchase or redemption at Wailea Golf Club or at the Crystal Lodge. Gift Card purchases are not eligible to earn GolfBC Rewards Points. Refund Policy: Gift Card purchases are non-refundable. Should you have completed a transaction in error, please forward your email confirmation along with a description of the error, to info@golfbc.com within 24 hours. *Note: at seasonal golf courses when the golf course is closed for play Gift Cards can still be purchased through the Administration Office during office hours. **Gift Cards purchased with AMEX may take up to 5-7 days prior to shipping, due to delays with AMEX processing. Gift Cards come in a sleek carrier, shipped by mail to you or directly to recipient. Register your Gift Card online to protect your card and to check your balance! Need a top-up? Add value online to your existing card.